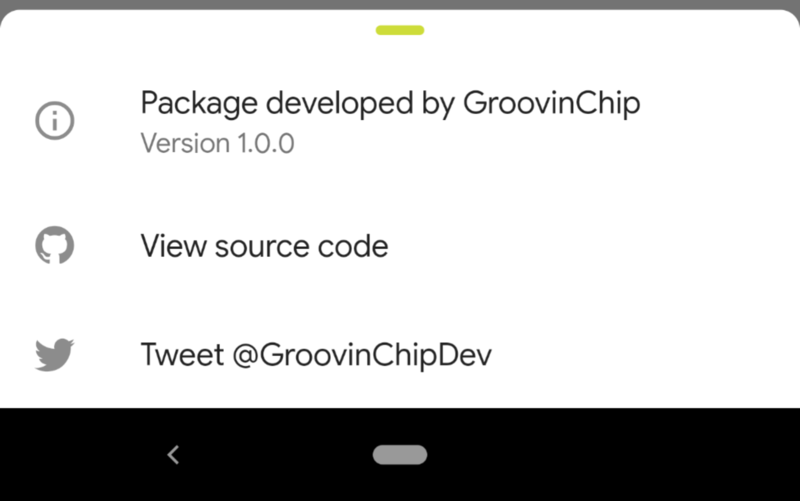 A Flutter package containing widgets created by GroovinChip. ModalDrawerHandle allows you to add a highly customizable drawer handle widget to your modalBottomSheets. The recommended use of this widget is within the showModalBottomSheet builder (or the showRoundedModalBottomSheet builder, if you prefer the package by Gildaswise like I do). As such, developers can pass in any or all of their own custom values to the constructor as they choose. OutlineDropdownButton is a standard DropdownButton with one additional feature: the ability to wrap it in a border. Every property that you'd expect to customize about a DropdownButton is available to the developer, and the InputDecoration that the OutlineDropdownButton uses is also fully customizable. This widget builds the InputDecoration explicitly in the widget rather than the constructor due to form validation limitations. However, the decoration is open for customization. This widget is a modified Expansion tile that allows for more customization over its appearance. You can customize the BoxDecoration of the ExpansionTile so you can remove the lines that appear above and below it when expanded, and so on. ExpansionTile builds a ListTile for the user to tap on; GroovinExpansionTile builds a custom ListTile so that you can add a subtitle and adjust the border radius of the InkWell the tile is contained in. As of version 1.2.1 of this library, this widget's default trailing icon will have a set color of Colors.grey. This icon color is open to customization via the parameter defaultTrailingIconColor. line 94 col 20: The value of the field '_backgroundColor' isn't used. line 141 col 17: The value of the local variable 'borderSideColor' isn't used. Run flutter format to format lib/groovin_widgets.dart. Run flutter format to format lib/modal_drawer_handle.dart. Run flutter format to format lib/outline_dropdown_button.dart. Run flutter format to format lib/outline_dropdown_button_form_field.dart.